Photo Caption: (L-R) Miss Mulatto, Nova, Mani, Jermaine Dupri, Flau'jae, Deetranada, and King Roscoe attend Lifetime Presents, "Rap Game" Season 3 Premiere Event at Wish Boutique on January 7, 2017 in Atlanta, Georgia. 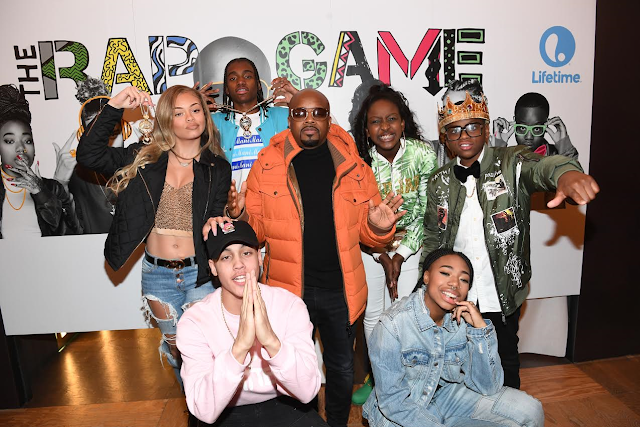 From executive producers Queen Latifah and Jermaine Dupri, the third season The Rap Game kicks off as Tally, season two fan favorite, returns for redemption to battle it out against four new young rappers. This season, social activist Bernice King, the daughter of Coretta and Martin Luther King Jr., makes a special appearance. Rappers Da Brat, Bow Wow, Rick Ross, Fabolous, Jon Jon, I Heart Memphis, Jeezy, and Jadakiss, singer Kelly Rowland, and producers Brian Michael Cox, Zaytoven, and Mike Kalombo, join Dupri to help guide the artists to victory with a recording contract with Dupri’s label, So So Def Recordings.